Print your 8th grade math test before you start and then try to answer all the questions. If 2x3 = 54, what is x? a. Which set contains only rational numbers? b. Pull out all the irrational numbers from each set above and write them down here. To go to school, you have to walk 6 miles east and then 8 miles north ? a. Which of the following is the correct expression for r or the radius in terms of A and pi? b.Use the correct formula you found in part a and pi = 3 to find r when A = 48 square feet. A company charges a flat fee of 1500 dollars to rent a yacht. In addition, renters must pay 100 dollars per hour. a. Which equation shows the cost C to rent a yacht for h hours? b. How much would it cost you to rent a yacht for 5 hours? c. What is the slope of the cost? what is the y-intercept? d. Using the answers for c, graph the cost on the coordinate system. Escalator 1 has a rise of 6 and a run of 4. Escalator 2 has a rise of 12 and a run of 6. Do the escalators have the same slope? Explain with math computation. Celita has a garden shaped like a square. How does the area changes if she triples the length of each side? Find the volume of a cone with a radius of 8 inches and a height of 3 inches. a. Look at the figure above and then tell which graph(s) show the following correlation. b. What kind of correlation is the following situation? 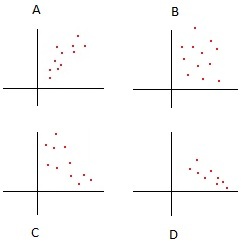 c. If a scatter plot shows a negative correlation, which line of best fit could represent the scatter plot? What is the equation of a line that has a slope of 3/5 and a y-intercept of 2? 100 students take a survey to see what kind of ice cream people in America like to eat. Which of the following will most likely flaw the survey? D. Choose students from a variety of schools. Which statement shows the similarity between the following 2 graphs? A tree is 8 feet tall and cast a shadow that is 6 feet. a. If your child's height is 4 feet, which equation can you use to find the length of his shadow? a. Which proportion can you use to solve this problem? Solve the following silmultaneous equations. Want a solution to this 8th grade math test? Add to your shopping cart and purchase a Detailed 28 PAGES SOLUTION and TOP-NOTCH EXPLANATIONS with PayPal.